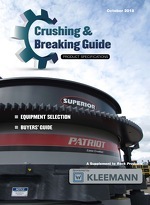 When it Comes to Crushing, If You Don’t Measure It, You Can’t Manage It. 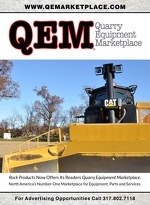 Texas Quarry One of the First in the State to Go to a Dry Dust-Suppression System. Ryerson University researcher Xavier Fernando is developing technology to make reliable wireless communication possible in underground mines. Even a casual mention of 9/11 and each of us will remember specific details about where we were and what we were doing when America was attacked in 2001. Case in point: I've maintained, even going so far as to profess this insight to my bosses, that once this recession ends, the aggregate industry will return to business as usual. Martin Marietta Materials now expects 2009 net earnings to be in a range of $2.70 to $3.30 per diluted share. World cement consumption is expected to decline 1.7% in 2009, a modest drop that is cushioned by a roughly 4% growth in utilization by China and India. Cemex received the United Nations' Habitat Business Award in the category of Accessible Housing Solutions for its programs Patrimonio Hoy and Centros Productivos de Autoempleo. On July 6, President Obama ended the speculation about who would run the Mine Safety and Health Administration by sending long-time union man Joseph Main’s name to the Senate for confirmation. I can see it now. I pull in to fuel up my car, swipe my card, select my grade and begin pumping. As the gasoline flows, a video pops up on the pumps screen. A safety consultant believes safety professionals must change their mind-set if they hope to prevent serious injuries and fatalities in their workplaces. Robert Jones had logged 25 years with Rogers Group before moving to Indiana Mineral Aggregates Asscociation to replace long-time director Bruce Mason, who retired more than six years ago. 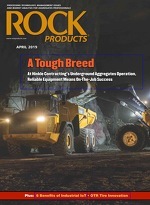 Rock Products caught up with Jones in his Indianapolis office in April to talk about the state's aggregate industry and how it is surviving the recession. The federal government is making $1 million available immediately in emergency relief funds for Iowa to help pay for urgent repairs to roads and bridges damaged by floods, U.S. Transportation Secretary Mary E. Peters announced today. Recent economic data reinforces Portland Cement Association’s outlook for continued declines in housing starts, according to a PCA Flash Report. The House of Representatives has dropped a provision that would have provided an $8-billion fix to restore solvency to the Highway Trust Fund's. Road funding also continues to take a beating as fewer gallons are consumed and legislators propose suspending fuel taxes. Shake, Rattle N Roll:A Workplace Hazard?